Eyelets are fairly simple devices and are usually manufactured using metal stamping machines and processes. 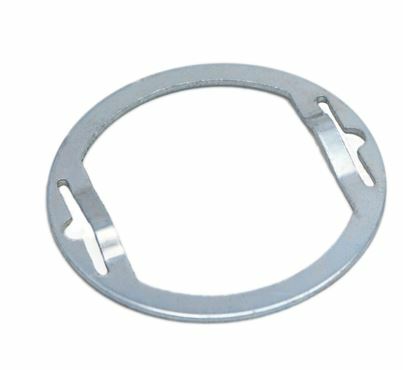 An eyelet consists of a metal ring with a flange surrounding the center hole. The ring extends into a longer barrel which can be inserted into a hole in the material. Once the eyelet has been inserted, the barrel can be set using a range of different tools and machines. Setting the eyelet causes the barrel to spread out sandwiching the material between the flange and the expanded barrel. The hole in the material is now strengthened with a short metal tube running through it and a metal ring surrounding the edges of the hole. This greatly reduces the likelihood of tearing and damage to the hole. The size of the eyelet typically determines its strengthening capabilities. For example, a larger flange size translates to greater strength. When selecting an eyelet, there are several important aspects of your applications to consider. Hole size is the most important consideration. Obviously, the eyelet must have the correct diameter to fit through the hole, but it also needs to have an appropriate flange diameter to provide adequate strength for your specific applications. Similarly, material thickness should be considered to ensure that the barrel of the eyelet is long enough to extend through the material. It is also important to choose an eyelet material that best suits the requirements of your applications. 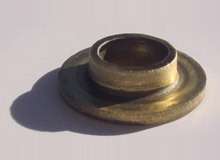 Eyelets can be manufactured from many different materials, including brass, aluminum, and steel. Material choice will depend heavily on whether your applications are more for decorative or industrial purposes. Industrial applications will probably require a heavier duty material like steel while brass might be more appealing for decorative applications. Eyelets An eyelet, a smaller version of a grommet, is a metallic ring used to strengthen or reinforce holes punched in thin materials. These devices are most often used in fabrics, sheet metal, and other thin fibrous materials. Without eyelets, holes in thinner materials are prone to tearing, but an eyelet helps prevent abrasion and other damage.